Workshops on SOLAS Core Themes 4 and 5, 27-29 November 2018, Roma, Italy. Agendas and keynote speakers announced! Agenda and invited speakers of both workshops have been announced. Have a look here. 2 October 2018: Early registration closes. More details and information about the workshops objectives here. 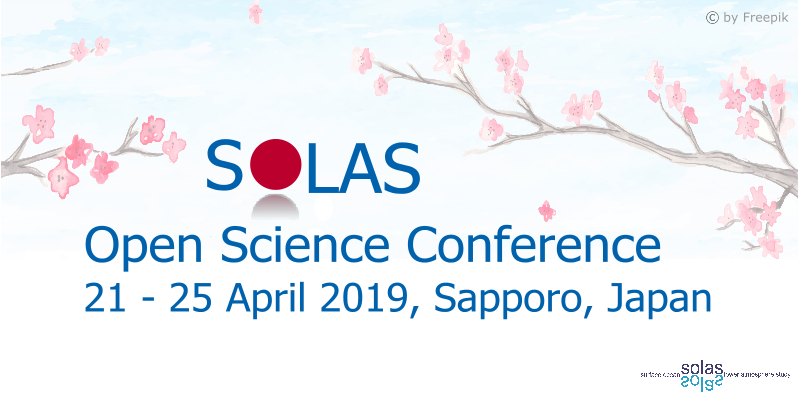 SOLAS Open Science Conference 2019: Keynote speakers announced! The conference website has been updated with accommodation possibilities in Sapporo and several special rate options. Book your hotel here. Or check out reasonable hostels here. Visit the official conference website for further details. SOLAS session at the 4th Xiamen Symposium on Marine Environmental Sciences (XMAS-IV). Abstract submission deadline EXTENDED! The 4th Xiamen Symposium on Marine Environmental Sciences (XMAS-IV), will be held in Xiamen, China, from January 6-9, 2019. The C4 SOLAS session on "Surface Ocean and Lower Atmosphere Study—Air-Sea interactions and their climatic and environmental impacts" invites submissions that discuss: (1) greenhouse gases and the oceans; (2) air-sea interface and fluxes of gases, particles, microorganisms, and energy; (3) interactions between anthropogenic pollution and marine emissions; (4) atmospheric deposition and ocean biogeochemistry; (5) characteristics of particles and their abilities to form clouds (CCN and IN); (6) interconnections between aerosols, clouds, and marine ecosystems; (7) ocean biogeochemical control on atmospheric chemistry and atmospheric transformations of gases and particles. Submit an abstract by 15 September 2018 here. SOLAS is pleased to inform you that Esther Rickert, the new project officer based at GEOMAR Helmholtz Centre for Ocean Research Kiel, Germany, joined the International Project Office (IPO) on 1 September. Welcome Esther! Esther is a marine ecologist, who obtained her diploma of biology, with the subject combination of botany, microbiology, and marine chemistry from the University of Kiel, Germany. She did her doctoral thesis in the field of chemical ecology at GEOMAR in close cooperation with the Institute for Inorganic and Analytical Chemistry, Jena, Germany. After her PhD, Esther worked as a postdoc and scientific project coordinator on a remote sensing project located at the Research and Technology Centre (FTZ) of the Kiel University operating on the interface between applied ecological research and the implementation of government policies. She participated in the international “Seabird at Sea” monitoring program as an observer for many years monitoring seabirds and marine mammals from low-flying aircrafts or research vessels. The 14th iCACGP Quadrennial Symposium & 15th IGAC Science Conference will take place 25-29 September 2018 in Takamatsu, Kagawa, Japan. SOLAS will participate in the event, as well as in the iCACGP and IGAC annual meetings. The iCACGP-IGAC 2018 Program and Abstracts are now available here! Version 3 of the FluxEngine toolbox now available! The FluxEngine is an output from the joint ESA - SOLAS project, 'OceanFlux GHG' and an open source toolbox for calculating air-sea CO2 gas fluxes from in situ, model and Earth observation data. The FluxEngine can be used through the web portal here or the open-source code can be downloaded from github here. For more information, including papers that have used the FluxEngine, please see here. The Steering Committee of the Deep Ocean Observing Strategy (DOOS) is requesting input on the content of the draft DOOS Science and Implementation Guide (SIG) by 14 September 2018 here. The 2nd workshop of the Korea-US inDian Ocean Scientific (KUDOS) Research Program, 6-8 November 2018, Scripps Institution of Oceanography, USA. Submit a poster abstract by 14 September 2018 here. Call for nominations to SPARC's Scientific Steering Group (SSG). Submit a nomination by 15 September 2018 here. The 6th Argo Science Workshop, 22-24 October 2018, Tokyo, Japan. Register by 15 September 2018 here. The EGU Election Autumn 2018 for the next EGU Treasurer will take place from 1–30 November 2018. Submit a nomination by 15 September 2018 here. The Fourth Xiamen Symposium on Marine Environmental Sciences, 6-9 January 2019, Xiamen, China. Submit an abstract by 15 September 2018 here. Submit a manuscript to the ECCWO special issue of the ICES Journal of Marine Science by 15 September 2018. More information here. Call for US CLIVAR Workshops. Submit an application by 28 September 2018. More information here. The 4th CLIOTOP Symposium, 15-19 October 2018, National Taiwan Ocean University, Keelung, Taiwan. Register by 30 September 2018 here. The 8th International Symposium on Non-CO2 Greenhouse Gases (NCGG8), 12-14 June 2019, Amsterdam, The Netherlands. Submit ab abstract by 1 October 2018. More information here. The SOLAS-IMBER Working Group on Ocean Acidification (SIOA) calls for bids to organise and host the 5th Symposium on the Ocean in a High-CO2 World in 2020. Submit your bids by 1 October 2018. More information here. Future Earth is seeking international organisations to become part of its Governing Council. Submit an application by 1 October 2018 here. CLIVAR Scientific Steering Group (SSG) and CLIVAR panels call for nominations for four new members. Submit a nomination by 10 October 2018 here. The International Ocean Deoxygenation Conference (website) was held from 3-7 September 2018 in Kiel, Germany. The conference was organised by the Collaborative Research Center (SFB 754) which addresses the threat of ocean deoxygenation, its possible impact on tropical oxygen minimum zones and implications for the global climate-biogeochemistry system. One outcome of the conference is the 'Kiel Declaration', in which the scientists call for more marine and climate protection and more international awareness of oxygen depletion. The declaration can be signed here. Submit papers on topics relevant to short-lived climate forcers and their implications for air quality can be submitted to the lead authors of IPCC AR6 WG1 chapter 6 (‘Short-lived climate forcers’) via ar6chapter6papers@ipcc-wg1.fr. All papers received will be treated as confidential. The deadlines for citation in AR6 WG1 are submission by 31st December 2019 and acceptance by 30th September 2020. Please include in the subject of your email: ‘IPCC AR6 WGI Chapter 6: Relevant paper’. The 6th Sustainable Ocean Summit (SOS), Hong Kong, 14-16 November 2018. More details here. EuroMarine 2019 General Assembly, 30-31 January 2019, Cádiz, Spain. More information here. 7th Kaplan Symposium: Tracers in the Sea: Trace Elements and their Isotopes in the Oceans, Future Directions and Instrumental Frontiers, 11-13 February 2019, Eilat, Israel. More details here. Sources and Sinks of Ocean Mesoscale Eddy Energy, 12-14 March 2019, Tallahassee, Florida, USA. More information here. The ICTP-CLIVAR Summer School on “Eastern Boundary Upwelling Systems: Assessing and understanding their changes and predicting their future”, 15-21 July 2019, Trieste, Italy. More details here. Report on 'IOCCP-JAMSTEC 2018 Inter-laboratory Comparison Exercise of a Certified Reference Material (CRM) for Nutrients in Seawater' published. Read the report here. Anthropocene: Innovation in the Human Age, a publication of Future Earth and an initiative of the Future Earth Media Lab, has released its third issue in print and online. Read the magazine here. PAGES calls for proposals for a new working group. Submit a proposal by 4 October 2018. Details here.